The newly-inaugurated board of the Agricultural Development Bank (adb) has promised to undertake aggressive and extensive recovery of the bank’s outstanding loans in order to meet the new minimum capital requirement of the Bank of Ghana (BoG). During the inauguration of the new board in Accra, Alex Bernasko, Board Chairman said adb would make strenuous efforts to retrieve the funds in arrears in order to meet the new minimum capital requirement by December. “I’m confident we will meet the GH¢400 million capital requirement by the end of this year, but we need to pursue an aggressive programme to retrieve all outstanding loans due the bank,” he said. 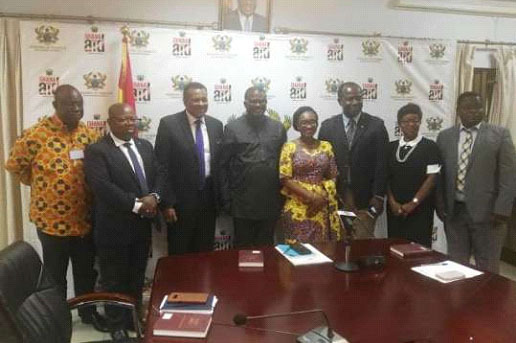 Charles Adu-Boahen, a Deputy Finance Minister, in an address, charged the new board to work assiduously to achieve its core mandate of supporting the growth of the agricultural sector. He said though adb remained the leading financial institution in agriculture financing in the country, its total credits to the sector had reduced over the last four years, while its credit to the services sector had increased during the same period. He, therefore, charged the board to address the anomaly and come out with strategic plans to place the bank among the five best performing banks in the country as soon as practicable. Meanwhile, the number of directors has declined due to the annulment of shares of four institutional shareholders by the Bank of Ghana (BoG) last month. They include Starmount Company Limited, EDC Investment, SIC Financial Services and Belstar Company limited. The Central Bank explained that their shares were annulled because they purchased them under suspicious circumstances. In view of the annulment of their shares six directors were removed from the Board. They include Patrick Kingsley-Nyinah, Kwabena Dapaah-Siakwan, Nana Ama Serwaa Bonsu, Frank Kwame Osei, Dr Adu Anane Antwi and Professor David Abdulai. They have since been replaced by Dr Mark Assibey Yeboah, Abena Osei-Asare, Professor Peter Quartey, Kwesi Korboe and Mary Abla Kessie. The three existing board members are Alex Bernasko, George Kwabena Bankwa Yeboah and Dr John Kofi Mensah, Managing Director.